I will refine this post as I code more methods. This is an attempt to learn this data structure and explain what I think I understand using pictures drawn using TEX. I use the tikz editor. The algorithm code is based on pseudo-code from “Introduction to Algorithms” by Thomas H. Cormen et al. I use Java language features like enums etc. wherever possible. I check the colors like this. Now this tree has to be fixed so that it conforms to the rules that govern a Red-Black tree. So I code a method to fix it. This method is based on the pseudo-code from the same book. But I think there is a bug which I haven’t found. This tree after it is fixed looks like this. The black height property is 2. 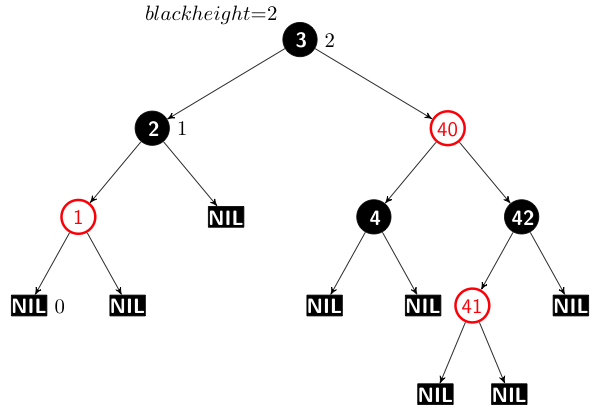 The black height property for the left branch is 2 but it is 3 for one of the paths on the right. I may have to read some other book because finding this bug is going to be hard. Actually the tree should be like this.